WASHINGTON — Hillary Rodham Clinton and former President Bill Clinton reported Friday that they earned more than $30 million combined in speaking fees and book royalties since January 2014, putting them firmly within the upper echelon of American earners as the former secretary of state seeks the White House again. The earnings put the couple in the top one-tenth of 1 percent of all Americans. While Clinton has begun her second campaign for president by casting herself as a champion for middle-class voters, she’s long drawn criticism from Republicans about the wealth she and Bill Clinton have generated since he left the White House. That includes their ability to command six-figure fees for delivering speeches to corporations and trade groups, which the report lists in detail. The finances behind the family’s charitable foundation have also generated scrutiny because of its acceptances of donations from foreign governments. During last year’s book tour, Clinton told an interviewer her family was “dead broke” when they left the White House, which Republicans said showed a lack of understanding of the needs of typical families. Liberals have also questioned whether Clinton is too closely tied to Wall Street, pointing to her days representing New York in the U.S. Senate. They are also wary she might not aggressively seek to regulate the nation’s financial industry and serve as an adequate bulwark against economic inequality. The FEC filings show that the couple earned more than $25 million for more than 100 paid speeches between January 2014 and May 2015. That is an average fee of about $250,000 per speech. Clinton was paid to speak to financial firms such as Deutsche Bank and Ameriprise Financial, trade groups like the National Automobile Dealers Association and the Advanced Medical Technology Association, and tech companies such as Salesforce.com and Cisco. One of her final paid speeches was delivered in March to eBay, which paid her $315,000, the records show. During a speech in April 2014, a woman tossed a shoe at Clinton while she addressed the Institute of Scrap Recycling Industries meeting in Las Vegas. Her fee for that event was $225,000. The filing lists more than four dozen speeches from the former president, including appearances during the past week with Univision and Apollo Management Holdings in New York and the American Institute of Architects in Atlanta. The report also lists assets of between $5 million and $25 million in a mutual fund managed by Vanguard that the Clintons set up in the past year. The couple did not earn any capital gains during the period and paid an effective tax rate of more than 30 percent in the 2014 tax year, said a Clinton campaign official who spoke on condition of anonymity in order to discuss the report. It also shows the Clintons paid off their mortgage. Clinton does not list any liabilities in the latest filing; in 2012 she reported a 30-year mortgage on a personal residence valued at between $1 million and $5 million. Clinton last filed a financial disclosure report during her final year as Secretary of State in 2012, when she reported that her and her husband’s wealth was estimated between $4 million and $20 million. Much of that income came from the lucrative speeches and appearances made by Bill Clinton around the world. 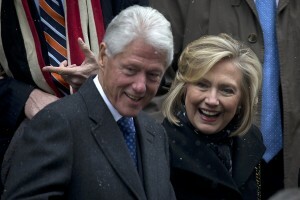 A recent Associated Press review of the Clintons’ disclosures and State Department records found that Bill Clinton had been paid at least $50 million for his appearances between 2009 and 2012, the four years that Hillary Clinton served as the nation’s top diplomat. Federal candidates are required to file personal financial disclosures within 30 days of announcing their candidacy or on May 15. Several Republican candidates in the race filed a request for an extension to those deadlines. Each disclosure form lists candidates’ assets and liabilities, and provides a snapshot of their annual income. But federal rules allow those figures to be reported in wide ranges instead of specific amounts – allowing candidates, for example, to report a large asset as worth between $1 million and $5 million. Left: Former U.S. President Bill Clinton and former U.S. Secretary of State Hillary Clinton depart the former Governor of New York Mario Cuomo's funeral in Manhattan, New York January 6, 2015. A new report shows the Clintons together earned over $30 million in speaking fees and book royalties since January 2014. Photo by Carlo Allegri/Reuters.